Before getting started with this kit, make sure to watch our free online class, Stamping on Metal. and check out our Stamping Landing Page for everything you need to know about stamping! SET007 Economy Block Uppercase Letter & Number Stamps 1/8"
SET035 Economy Block Lowercase Letter Stamps 1/8"
3" x 3" copper sheet to practice your stamping. An assortment of blanks with holes! 24" 2.4mm aluminum ball chain with connector. 2 Pro Polish pads -for shining up your metal blanks. We opted not to include these in the kit because some folks have a hammer. Some people might want to order all their blanks with the holes already in them!!! If you want to make your Kit extra special, purchase Lisa Niven Kelly's Stamping Metal Jewelry Book and DVD. It includes 19 new projects and a bonus project on DVD! 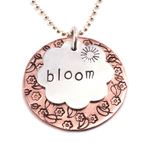 You can also order NEW Stamped Metal Jewelry by Lisa Niven Kelly and Taryn McCabe with 23 New Projects to LOVE! I like it! It has convenience and leaves a artistic mark that you look back on in years and say woo! The kit has everything you need when you dont know what you need. Its a lot of fun and I've already purchased other items. Don't hesitate. Excellent kit for those just getting started! It took the stress out of what is needed. Of course this kit fueled my passion in this craft now! I was curious about metal stamping, but I wasn't sure how to get started. It also seemed really expensive to go out and buy everything I needed before I know whether I enjoy stamping or not. This kit was a great, inexpensive way to get started. It's a lot of fun and I'm definitely hooked!